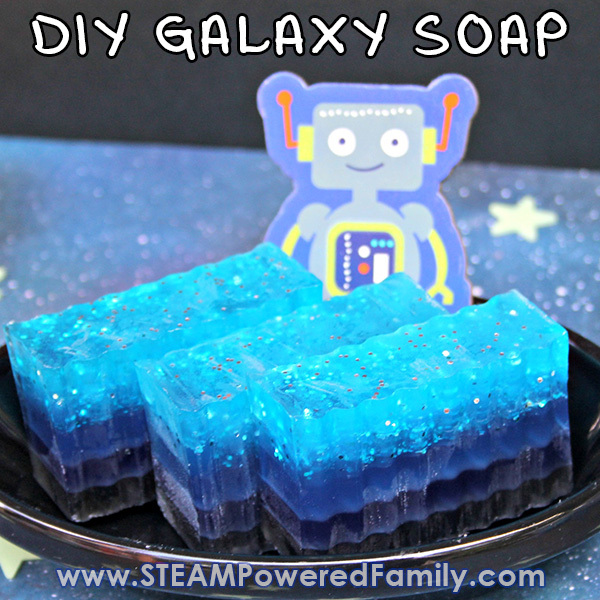 This DIY Galaxy Soap making project is an amazing addition to a space unit study, or as a “just because it’s awesome project” for your space lover. 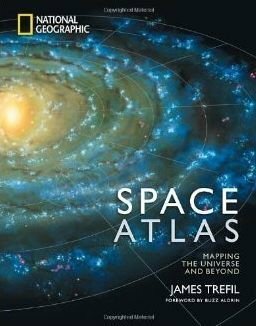 It is actually incredibly easy to do and produces a soap that captures the beauty of our star filled skies. 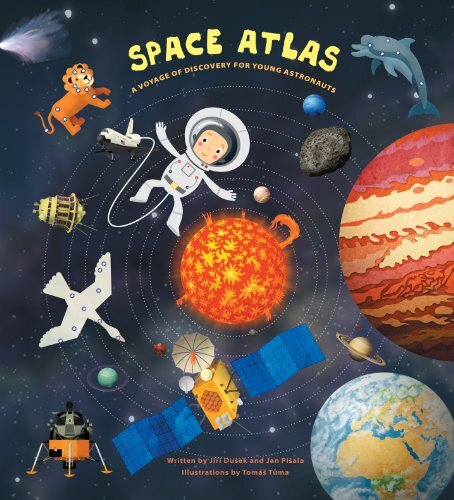 A wonderful and unique, hands on space project for kids. 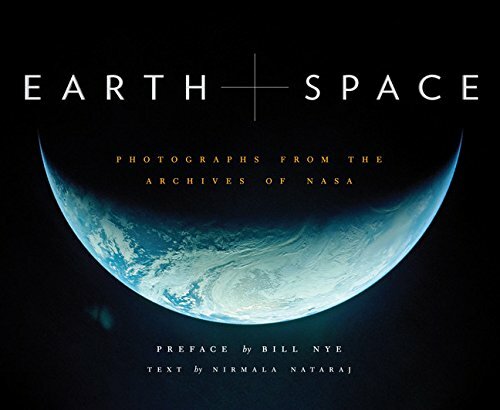 We LOVE space around here. In fact I would say we are actually obsessed. 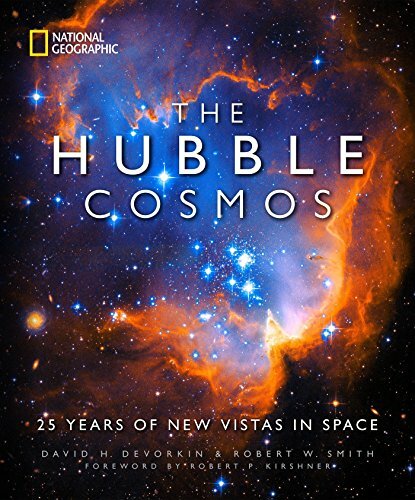 We never miss a meteor shower or eclipse, sky watching is a daily event around here, we recently spent my birthday in a dark sky preserve so we could look at space in the middle of the night at -35C, and we have listened to every Neil degrasse Tyson audio book on hoopla, numerous times. Oh and we made Galaxy bath bombs. So it only makes sense that we now make a Galaxy inspired soap! We really enjoy soap making. 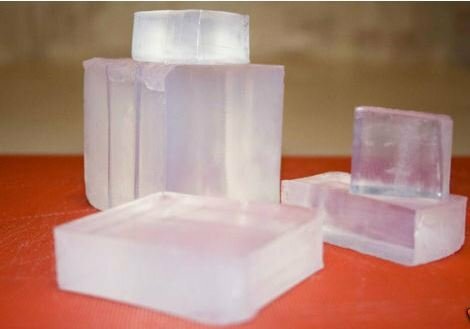 It is incredibly easy with melt and pour soap bases, and you can make some really high quality, luxurious soaps. 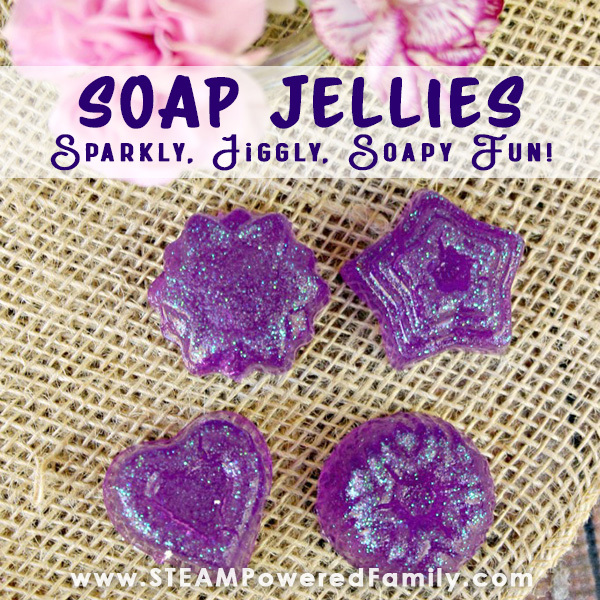 You can also make some really cool soaps to tie into your lessons. 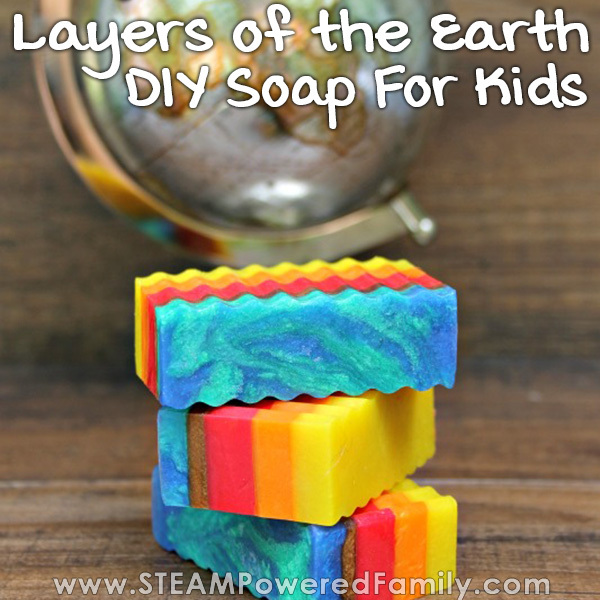 We had a blast making our Layers of the Earth Soap, it was a great way to reinforce the concept and help the kids really commit those layers to memory. Especially when they used that soap over the next few weeks, and would naturally recite the layers as they washed. Then we had fun creating a STEM project inspired by a Zoey and Sassafras book, Unicorns and Germs. We read the book, then did our own petri dish study to learn about germs and bacteria, and the importance of hand washing. 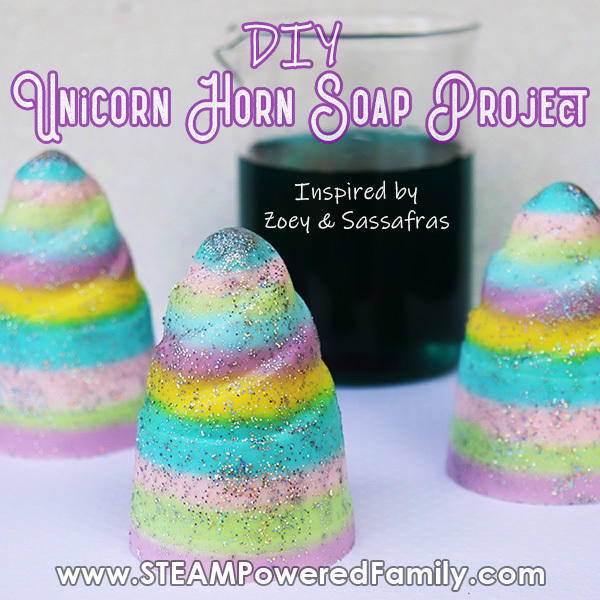 Then we made a beautiful, multi-coloured unicorn horn soap. 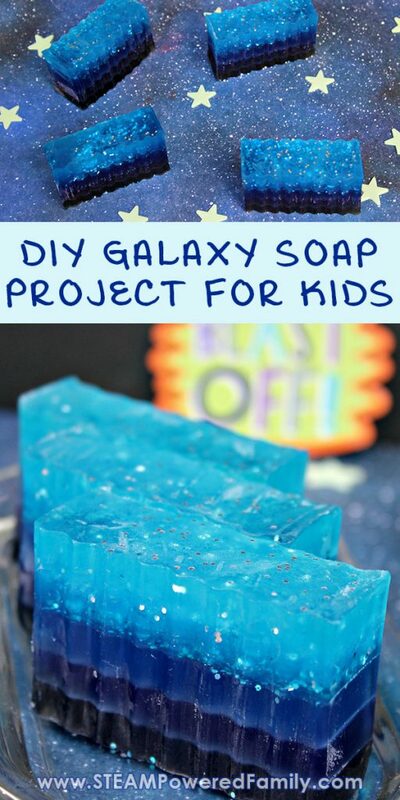 Once you start making soaps with your kids, you will find so many cool ideas. Like a heart soap in our Grinch bath bombs! 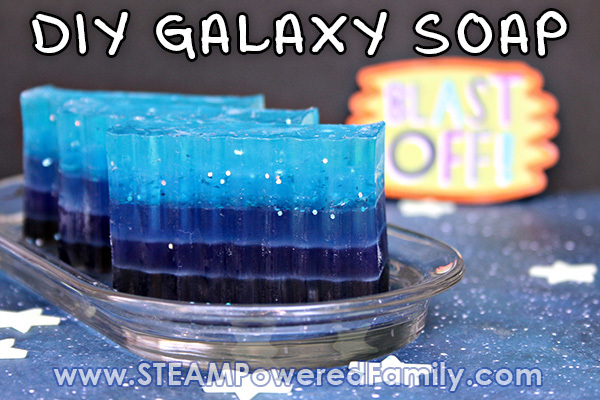 Or making a gorgeous, sparkling, Galaxy Soap. 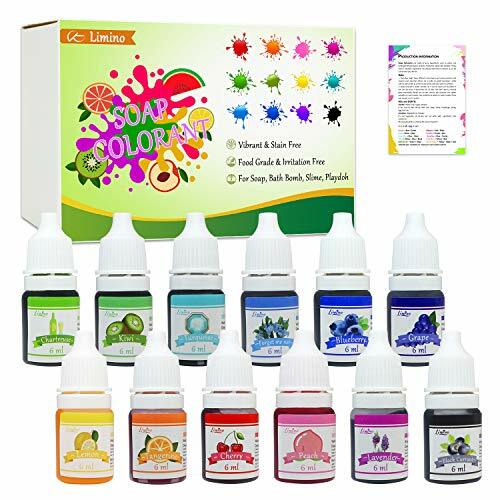 We create this soap in layers, which lends itself very well to using it as a fun mental break throughout the lesson. 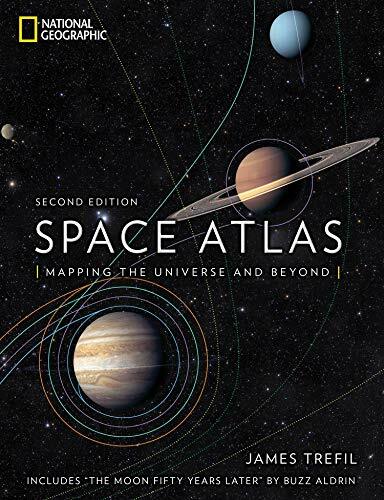 Create a layer, then while waiting for it to set read about space, do a structured lesson on space, or jump onto the Tappity App and do one of their fun, interactive lessons on space. Then come back and do the next soap layer. 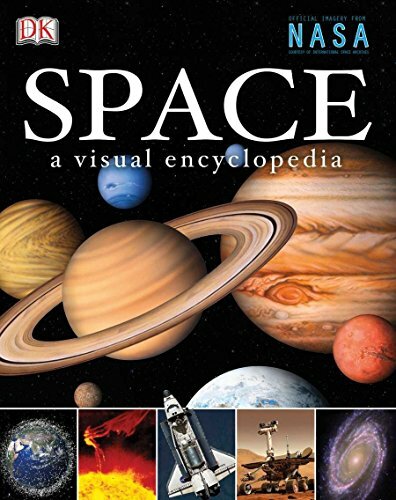 Repeat until the soap is finished and your kid is excitedly telling you all about what they now know about SPACE! Add 8 cubes of the clear soap base to one microwave safe bowl. Melt in 30 second intervals, stirring after each until it is completely melted. Add jojoba oil, ylang ylang essential oil and black currant soap color to bowl. Whisk oils and color into soap mixture. Spray bottom of mold with rubbing alcohol and pour the black currant colored soap mixture into mold. Spray with rubbing alcohol to prevent bubbles. Allow to harden at least 30 minutes. You know you can pour the next layer if you blow on the soap and it doesn’t ripple. Repeat steps in Layer #5 instructions, using the chamomile essential oil and grape soap coloring. Whisk oils and color into soap mixture. Spray black currant soap layer with rubbing alcohol. Be liberal, but don’t go overboard! This makes the layers adhere to one another. Pour grape soap mixture into mold. Spray grape soap layer with rubbing alcohol to prevent bubbles. Allow to harden at least 30 minutes. Repeat steps in Layer #5 instructions, using the peppermint essential oil and blueberry soap coloring. Whisk oils and color into soap mixture. Spray grape layer with rubbing alcohol. Remember to be liberal, but not to go overboard! Pour blueberry soap mixture into mold. Spray blueberry soap layer with rubbing alcohol to prevent bubbles. Allow to harden at least 30-45 minutes or until very hard and solid. Repeat steps in Layer #5 instructions, using the eucalyptus essential oil and forget me not soap coloring. Whisk oils and color into soap mixture. Spray blueberry layer with rubbing alcohol. Remember to be liberal, but not to go overboard! Pour forget me not soap mixture into mold. Spray blueberry soap layer with rubbing alcohol to prevent bubbles. 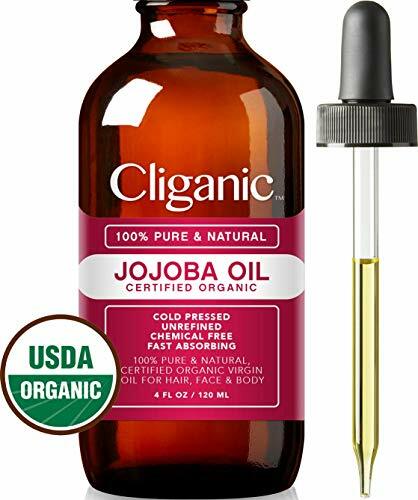 Allow to harden for about 5 minutes or until layer has a gel like quality. 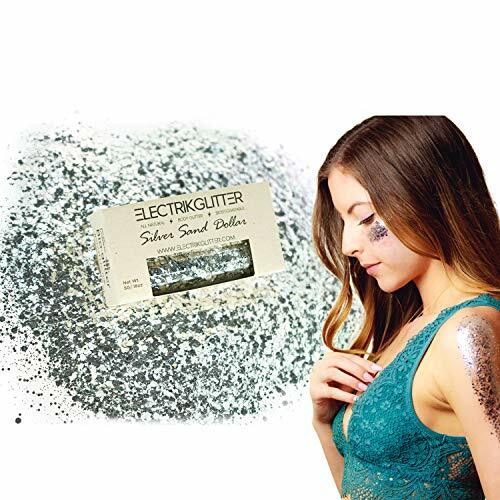 Sprinkle silver glitter and blend in GENTLY. Spray forget me not soap layer again with rubbing alcohol to prevent bubbles. Allow to harden at least 30-45 minutes or until very hard and solid. Repeat steps in Layer #5 instructions, using the rosemary essential oil and turquoise soap coloring. Whisk oils and color into soap mixture. Spray forget me not layer with rubbing alcohol. Remember to be liberal, but not to go overboard! Pour turquoise soap mixture into mold and spray with rubbing alcohol to prevent bubbles. Allow to harden for about 5 minutes or until layer has a gel like quality. Sprinkle turquoise glitter and whisk in GENTLY. Spray turquoise soap layer again with rubbing alcohol to prevent bubbles. Allow the soap to harden in the mold overnight. 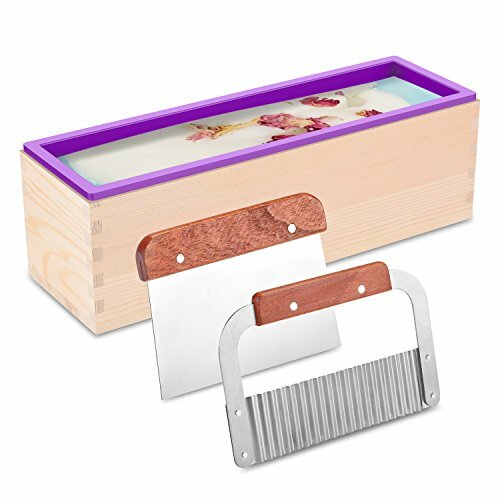 When you are ready to cut your soap, use the tools that come with the rectangle loaf mold, or you can use a large knife. Store in an airtight container until you are ready to use. They also make a great gift! 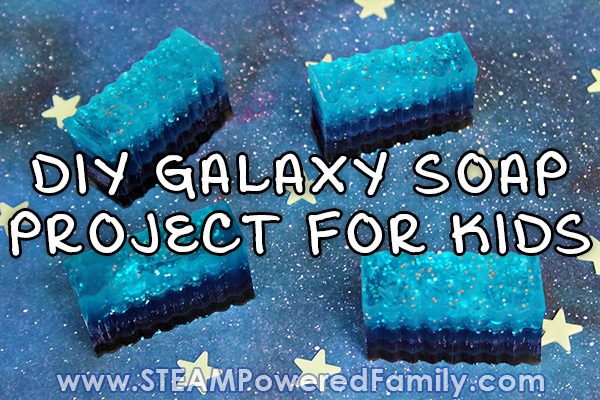 This Galaxy Soap that your kids will make in this project is absolutely gorgeous. It sparkles, just like the night skies. 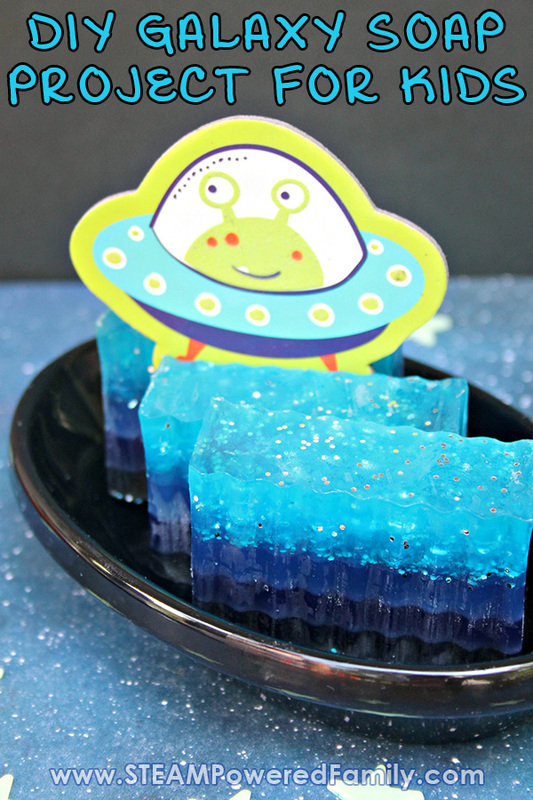 And every time your kids use this soap over the coming weeks they will be talking about all the amazing things they now know about space! And that is a fantastic way to help commit that information to long term memory.